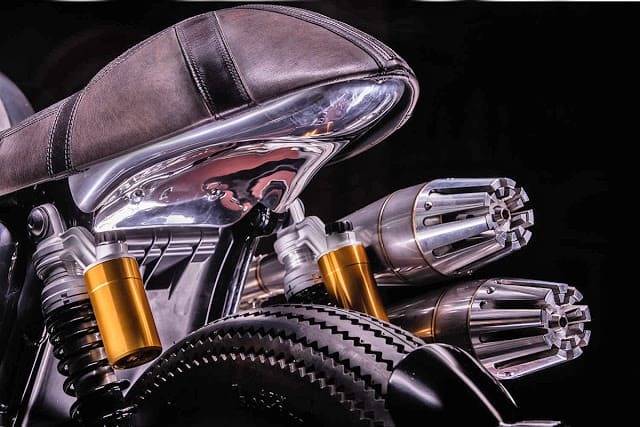 The Custom Motorcycle creations that are turning out today is so far advanced than back in the day as we have so many good machines from Water jet cutters to 10 axis CNC machines that can design , print and shape pretty much anything that you can pull out of your mind and install in Machine coding to its control box. Still, you of course will still need the skill set to be able to achieve just some of these processes, and when you look at today’s builds, not only is the engineering so smooth, the tolerances for detail are even finer. 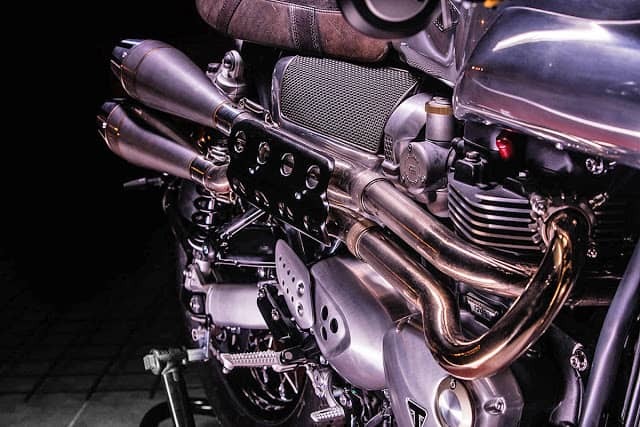 So, take for instance, the factory Triumph Thruxton R motorcycle, I mean, it is the quintessential Cafe style motorbike that Triumph them selves have re-invented and added everything you need for modern comfort and of course ride ability. 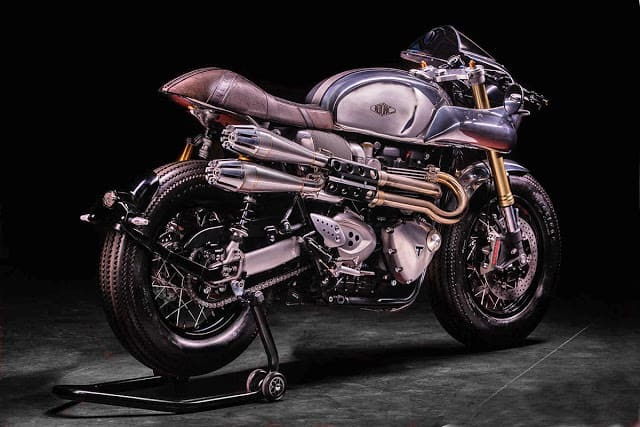 When the Thruxton R first came out here in the states, I was one of the earliest test riders of this model here and I was amazed at the way it handled, looked, felt and of course, reacted when I gave its neck a bit of a squeeze. The Perfect bike, nothing needed I thought to myself, but when you then give one of these thoroughbred motorcycles to a French Motorcycle company named Hedonic of which means. 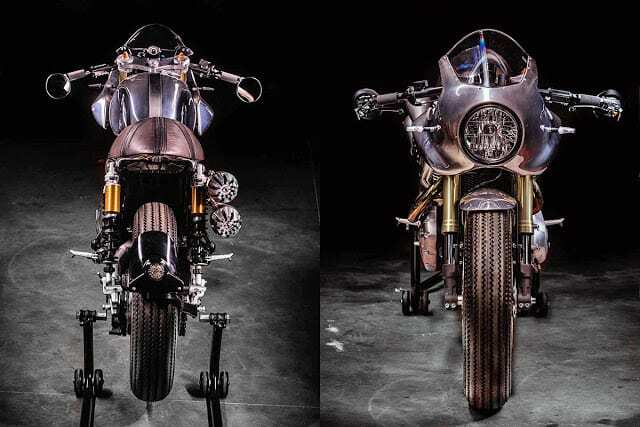 The Creator of this head turning machine is French Man Serge Heitz and he has made a number of head turning master pieces over time and this time he wanted to make sure you looked more than once when you see this Triumph Thruxton R heading towards you. 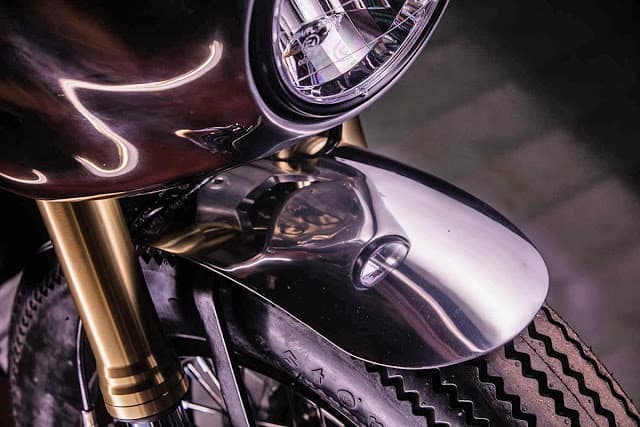 About 90 minutes from Bordeaux , the workshop is equipped with everything you require to fabricate steel to alloy and they sure know how to handle that. 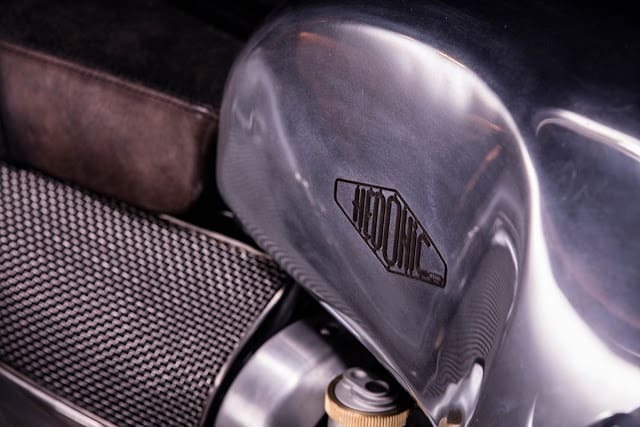 Any Motorcycle created by Hedonic will get so much attention to detail, you will be gobsmacked for at least half an hour when you see a finished product come rolling out of their doors. 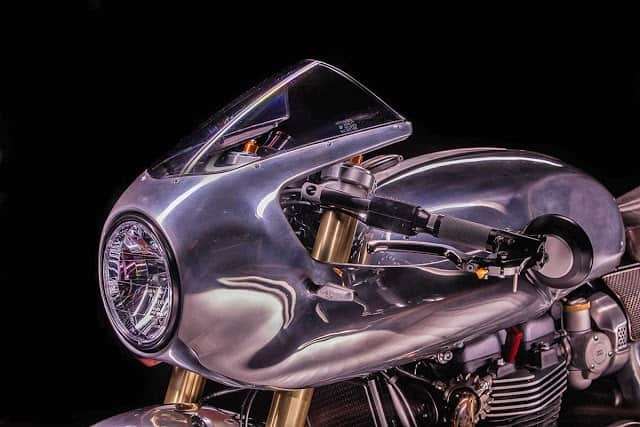 The bikes curvy Fairing, swooping lines of the Belly Pan and side covers and also the curvature of the Bobbed front Mudguard, are all hand made from Aluminum, with well over 150 hours of kneeling, banging, smoothing and hand massaging these components to the bike that you would think Rolls Royce engineers were creating this. The Aluminum parts were all hand rubbed for that brushed look to show the quality of the material and see no cheating had occurred, this is simply a work of art and so pleasing to the eye. The front end is ample enough for the roads of anywhere to be honest but Serg was not happy keeping it stock and wanted to put a twist to the front end of the bike by fitting a Yamaha YZF R6 front end, no easy task, no plans and some careful measurements and patience paid off. The Rims were changed in favor of 16 inch items and a set of Firestone square edged champion style tires were fitted, not everybody likes these but I personally do, albeit they handle like crap but look so thick and fill the bike out. Custom Clip ons were made with some very cool touches such as integrated brake master cylinder and clutch cable and wear inverted levers. 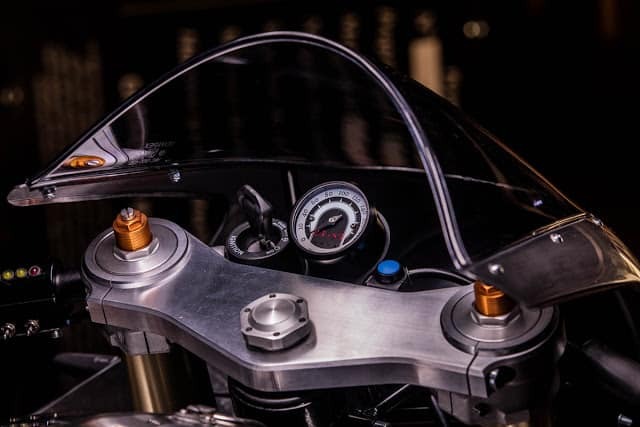 To slim down the bike’s proportions the factory indicators have been replaced by tiny LED units mounted to the fairing and rear wheel hugger. Under that Fairing is a custom triple tree along with some Moto gadget instruments, the whole top end is cleaned up and just shows the quality of the french man and his team can do. The Engine is just under 100 horses and ample enough for anyone to get into trouble with but a cool set of exhausts were made with Turbine rear caps to finish this Futuristic look off to a tea. The Brown Leather seat unit is a nice touch and I look forward to seeing a few write ups in magazine on this European Machine as it has so many cool angles that just flow, it would be nice to see more about it. Just wanted to share this with you today and hope you liked it half as much as I did, what a fun machine, something I would love to take out for a blap. 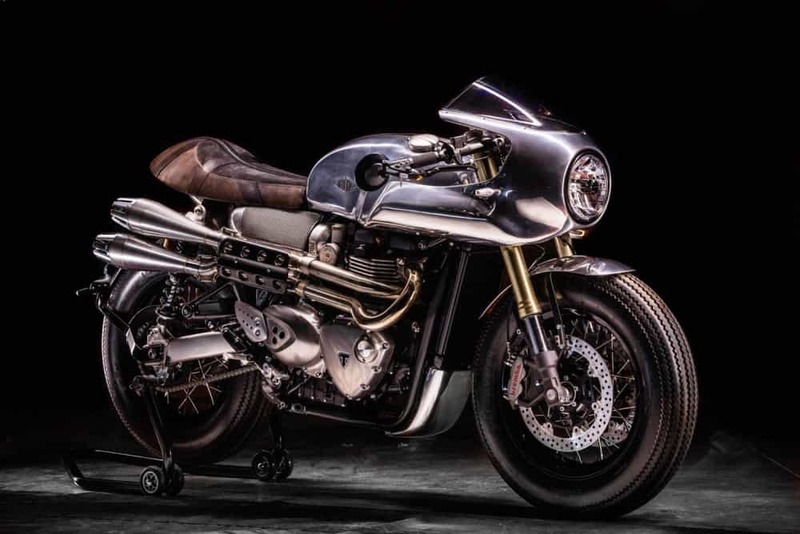 This entry was posted in Blog and tagged 1200, 59 club, alloy, built in garage, cafe racer, custom, fairing, Hand made, Hedonic, rocker, spirit of 59, thruxton, ton up, triumph, twinline.